All moms have to deal with odours. Everytime I have a party, I try to make sure it smells nice in the house - no stinky diaper smells! I recently tried out the Febreze products - the NOTICEables, Air Effects, and the Candles, as a promotional pack from Febreze. Scent intensity control (high or low). On the low setting, the product is supposed to work for 30 days. And it did! The scent strength also remains the same throughout the 30 days. Plug rotates to fit the outlet. Of the three products, I liked the NOTICEables best. The Febreze Candles works well enough, comes in a nice glass holder and is great for evening; it last 30 hours. The Air Effects I was least impressed with - while the scents were nice, and the odour did seem eliminated, the scent is basically gone within minutes. But then, that seems to be with the case for any spray air freshener I've tried. The Air Effects is supposed to be CFC-free (chemicals that can deplete the ozone). Febreze also has a new Night Light product that combines a night light with scent, which I haven't tried but it's a neat idea. 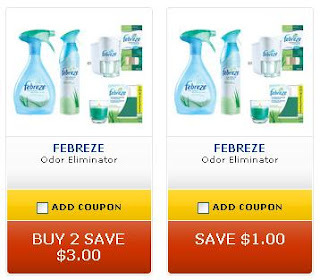 If you want to try these products out or have already been using them, Save.ca has some coupons for Febreze products through a special link. The coupons are for Buy 2, get $3 off, or Buy 1, get $1.00 off. Click here to get these coupons, as well as coupons for other products including Always, Tampax, and Orajel Children's Toothpaste. More information about the Febreze products can be found at Febreze.ca. 0 Response to "Febreze Coupons from Save.ca"